World University of Design, Sonepat has advertised in THE TIMES OF INDIA for the recruitment of Professor/Associate Professor/Assistant Professor job vacancies. Interested and eligible job aspirants are requested to apply with in 15 days. Check out further more details below. About College: Design is not just about the way things look, it is also about the way they work. Design creates value and contributes to competitiveness, prosperity, and well-being of a nation. India is poised for growth in almost all the fields and it is increasingly expected to compete globally in delivery of goods and services as per international standards. Design is being looked upon as the key aspect in making India competitive. 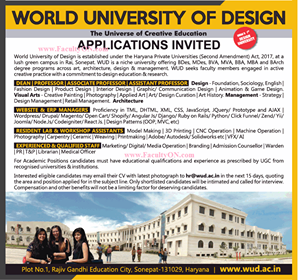 With a view to respond to this need through education, training and research World University of Design (WUD) has been established at Rajiv Gandhi Education City, Sonipat, Haryana - a hub of educational institutions of eminence in India, to accelerate the take-up of design in industrial and innovation activities at regional and national level.